The disc pulverizers of the PMMF series are available with disc diameter from 300 to 1000 mm. These pulverizers are high speed, precision grinders for the processing of medium hard, impact resistant and friable materials, suhc as PVC,LLDPE,LDPE,HDPE,PP,PC etc. The material to be pulverized is feeded by a vibrating feeder, and then come into grinding chamber at the centre of a vertically fixed grinding disc which is mounted concentrically with an identical high speed rotating disc.Becasue of the centrifugal force, it carries the material through the grinding chambe, and the end plastic powder is collected by a air blower and cyclone system with air lock. We can equippe with one piece grinding discs or grinding segments accoridng customers's specially requirement. ●The grinding disc can be regrinding after wear down to increase the service time. ●Easy and simple to handle, and have a long service life. The PNMF series automatic plastic mill is disk-type plastic pulverizer, which has the advantages of high capacity and low-power, This machine can be used for powder processing of PE, HDPE, PP, PS, ABS, EVA, PET, nylon and other materials. 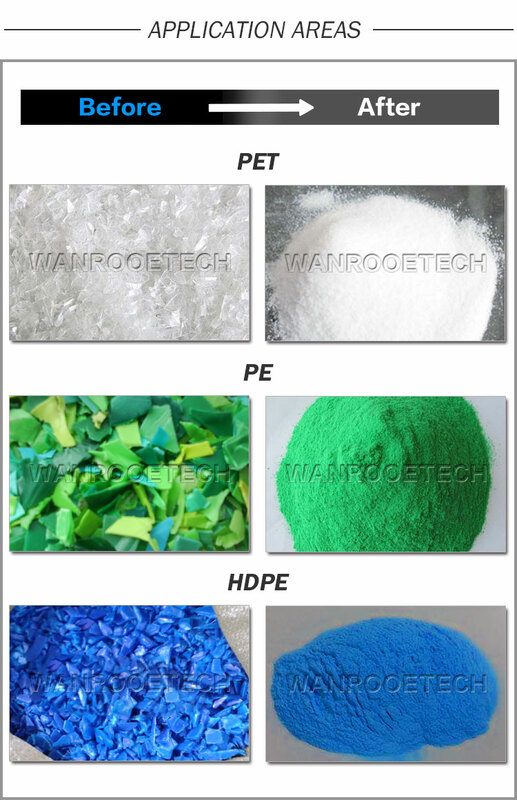 PNMF series plastic shredders can process powder sizes up to 20-120 mesh. Notes: The pulverizer capacity and technical parameter will be a little different according to the material status and also the kind. The frequency convertor also can be configured as optional if necessary. 30-90 working days since receiving advance payment. If you cannot wait for this suggested delivery time, please contact us freely, we will make any arrangements we can to meet your requirements. Wood Pallet, fumigation-free wooden cases if necessary. All the key parts of the equipment will be painted with anti-rust oil before shipment and packing. WANROOETECH will offer you all necessary documents, e.g. general layout plan, electrical diagram and user manual after the contract is executed. After informed machines ready for inspection, customer can send engineers to WANROOETECH; Customer also can consign WANROOETECH to finish inspection work. When the machines are delivered to customer's factory, please arrange preparation work before engineers arrive if require. Technicians will be responsible for guide on-site installation and testing machines involved. Meanwhile technicians will give free training lessons to labors in customer's factory. The customer just needs to bear expenses generated for this work, e.g. airplane tickets (round-way), residency, meals and allowance of USD50 per day for each technician. In case of quality/quantity discrepancy to destination port in transportation, customer should file claim within 30 days after the arrival of the goods at port of destination. 12 month since installation finish and machine normal working. During this guarantee period, WANROOETECH will provide spare parts without any charge in case of quality discrepancy caused by us. If the malfunctions are caused by your incorrect operations, WANROOETECH will provide spare parts at cost. 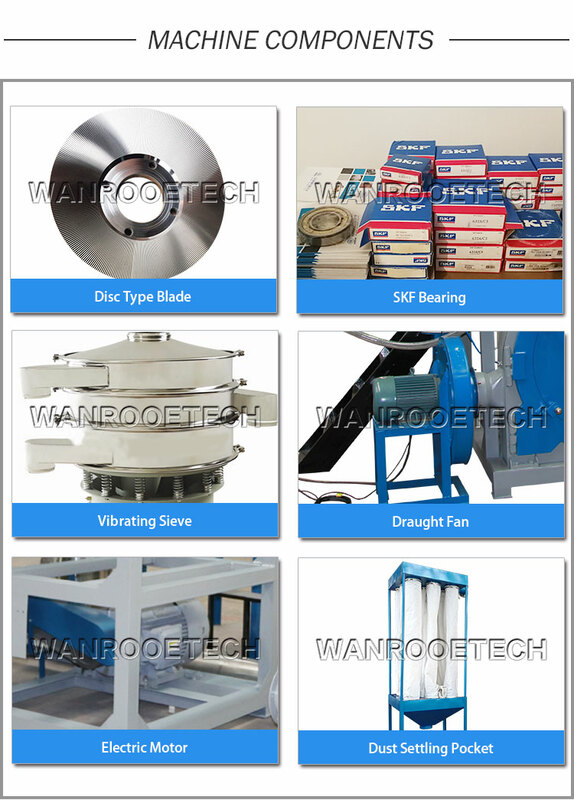 WANROOETECH will charge the buyer cost of spare parts beyond guarantee time and provide long-term technical guide. Didn't find what you are looking for? Post a buying lead. Copyright2014©WANROOE MACHINERY CO.,LTD. All rights reserved. Tips: All the items above can not be empty. Success! Thanks a lot for your inquiry!